Good-bye my sweet, beautiful boy....seven years with you was far too short but you made my heart smile every single one of those days. My P-Man, my Bubba, my Puppy, my Squishy Man....I will love you forever! There hasn't been a sweeter boy or a more gentle and loving cat EVER. Thank you for loving me and for letting me love you back, my Puppy. I'll miss your good morning wake up chirps most of all, I think. You're forever in my heart, beautiful boy and torn from it far FAR too soon. Be happy in kitty heaven my Bubbarenis, you're the handsomest kitty angel there and you can finally meet your big brother Jaxon, I always knew you two would be the best of friends! I love you, my Pumpkin, always and forever. An Unexpected Post, oh my!! I know it's not July yet but I just had to say HI! I figured this beautiful Peruvian pattern deserved to be on some genuine Peruvian feet so I knit a second pair for the P-Man's favorite gal, my next door neighbor, Giovana! I never in my wildest dreams ever thought this Florida girl would have a love affair with colorwork but again, ya never know! It's Time For the FKD Annual Post!! Things are pretty much SSDD here at Casa de FluffyKnitterDeb - still knitting, mostly socks, and still administering Sock Knitters Anonymous over on Ravelry and with over THIRTEEN THOUSAND MEMBERS (we're the fourth largest group on Ravelry!) it's like a full time job! I just thought I'd pop in and say hi because I do miss all my blog friends and I KNOW y'all miss the handsomest kitty on the Net! So once again, I bring you my friend Tina's feet wearing her latest "Christmas in February Socks". Of course even if it's only once a year, a FKD post wouldn't be complete without a little kitty beefcake! The P-Man has a birthday next week - he'll be 7 on July 10th, doesn't time fly! Come on over to SKA and say hello cause I miss y'all! So I'm still alive and kicking knitting but despite losing my blogging mojo I do still miss all my blog friends! Ravelry keeps me really busy - the group I administer, Sock Knitters Anonymous, is the third largest group on Rav and has almost 11,000 members!! Wowser! While I haven't been blogging, I have kept my sidebar with my yearly projects up to date so even if you aren't on Ravelry (and WHY NOT????) 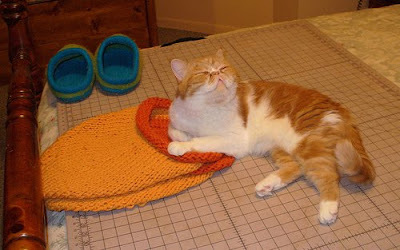 you can still see what I've been knitting and of course my tutorials will ALWAYS be around as long as blogger is. And of course this lil guy is as studly as ever! He's gonna be SIX next week, kinda hard to believe how time flies! Socks on Parade, Part Two! Two more socks for you my Knitbloglandia buds! My partner in crime fellow mod Bettina went so crazy for them that I promised to knit her a pair which I sent to Germany for Christmas in February! It's a super easy pattern that looks much harder than it is! I used a little bit heavier yarn than the pattern suggested so I made a ton of mods - all deets on on my Rav page (link above). And now for something completely different I give you....more socks! Needles: US# 1 (2.25mm) Hiya Hiya 32" circs, magic loop method. A certain handsome kitteh boy has a BIRTHDAY this week! My P-Man turns FIVE next Friday!! There isn't a sweeter lil chubler kitteh than you!